Celebrated the day before Valentine's Day, Galentine's Day was first introduced on the television show "Parks and Recreation"
Pasco County Commission candidates Kelly Smith, left, and Brandi Geoit prepare forms for their Galentine's Day meeting Monday, Feb. 12, 2018, in Lutz, Fla. Galentine's Day, which is celebrated on Feb. 13, is a day to celebrate not only women's friendships, but activism. In the light of the #MeToo movement, Galentine's Day marks the positivity of the women's movement and female solidarity. The unofficial holiday began as an idea on a popular sitcom. But this year, many women like Smith are turning it into part of the #MeToo movement. 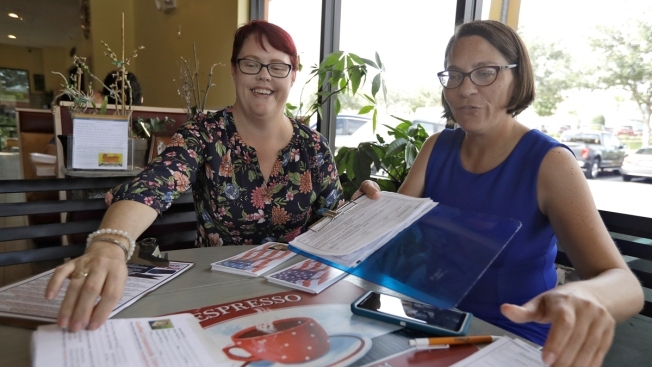 "Galentine's Day is about celebrating women working together, and that's how we're going to win," said Smith, who lives in Pasco County on the state's west coast. A candidate for another county seat, Brandi Geoit, is planning to attend. She thinks it's important for women to support other women — in part because of some of the inappropriate comments she's received from men while campaigning. "Guys asking me for hand massages and sending me pictures of their junk," she sighed. "We're basically saying that this is our holiday, this is important that a lot of women are standing up and saying that enough is enough." Celebrated the day before Valentine's Day, Galentine's Day was first introduced on the television show "Parks and Recreation." Amy Poehler, playing the character Leslie Knope, declared, "Every Feb. 13, my ladyfriends and I leave our husbands and our boyfriends at home, and we just come and kick it, breakfast-style. Ladies celebrating ladies. It's like Lilith Fair, minus the angst. Plus frittatas." It became a cultural movement of sorts — like Festivus, but with better food and less aggression. In recent years, women have marked the day with leisurely brunches, giving each other books or throwing parties that involve fizzy cocktails and, of course, waffles. But this year, women across the country are celebrating with more than just mimosas and Instagram-worthy gifts. It's a natural extension of the #MeToo movement for those marking a day of activism, politics and female solidarity. Sara Becker of Brooklyn, New York, formed a group called Nasty Galentines after President Donald Trump's election in 2016. Last Galentine's Day, she hosted a craft party where several dozen people wrote Valentine's Day cards to Congress. This year, she and friend Alissa Lentz are holding a networking party that they described on invites as "protesting with love." "We've been seeing the burnout rate across the board in terms of negativity," Becker said. "We wanted to bring positivity." Snowboarder Jamie Anderson won her second consecutive gold medal in slopestyle on Monday. Anderson put up a strong first run that held up through a second round of competition. Their event Tuesday night includes a panel of women discussing how they are overcoming the challenges of the past year in light of the #MeToo movement. The founder of Bust Magazine, the owner of a whiskey company and a business coach, among others, will speak. "We wanted to turn it beyond just a crafting party into a conversation," Lentz said. "We wanted female entrepreneurs to reflect on the last year, but also guide us as to how can we turn this into action and change and policy. Let's learn from one another." In Columbia, South Carolina, the Women's Rights and Empowerment Network and Sexual Trauma Services of the Midlands held a Galentine's-themed happy hour Monday evening. Guests were encouraged to write South Carolina's female legislators with concerns or gratitude. "In light of recent events in both our state and on the national stage, we felt it was important to celebrate the strength of those women coming forward to tell their story of assault and the strength of the support system female friendships can provide as women stand up and speak up together," said Lara Winburn, director of development for WREN. Others are marking the day privately. Antoinette Kerr of Lexington, North Carolina, is writing poems and letters to her friends on Galentine's Day cards. She's also encouraging people to donate to groups that help women. Kerr, who is on the board of the Raleigh, North Carolina-based nonprofit group Women AdvaNCe, said female friendship and activism empower women collectively: "We're not alone." Team USA’s Chloe Kim dominated the women’s halfpipe final to bring home the gold. In Los Angeles, event planner and blogger Emilee Sutherland celebrated with her girl crew over the weekend and wrote about how the day is about sending a message that "men aren't required" to make a woman feel whole. Valentine's Day can be difficult on many women, she said, and supporting one another is more important than ever against the backdrop of grindingly depressing sexual misconduct allegations in the news. "Women do a stellar job at judging one another and tearing each other down. And while no one is perfect, I think this holiday should focus less on men and society pressures, and more on learning how to love other women well ... including ourselves. We will be so much stronger as a whole if we do this well," she said.